Does your spouse spend the night nudging you to get you to stop snoring? Are you tired throughout the day? Maybe you spend a good chunk of your sleeping hours actually tossing from one side of the bed to the other. If so, you may be suffering from sleep apnea. The professionals at our Abbotsford Snore MD sleep apnea clinic can help you—and your partner—get that restful night of sleep you’ve been missing. 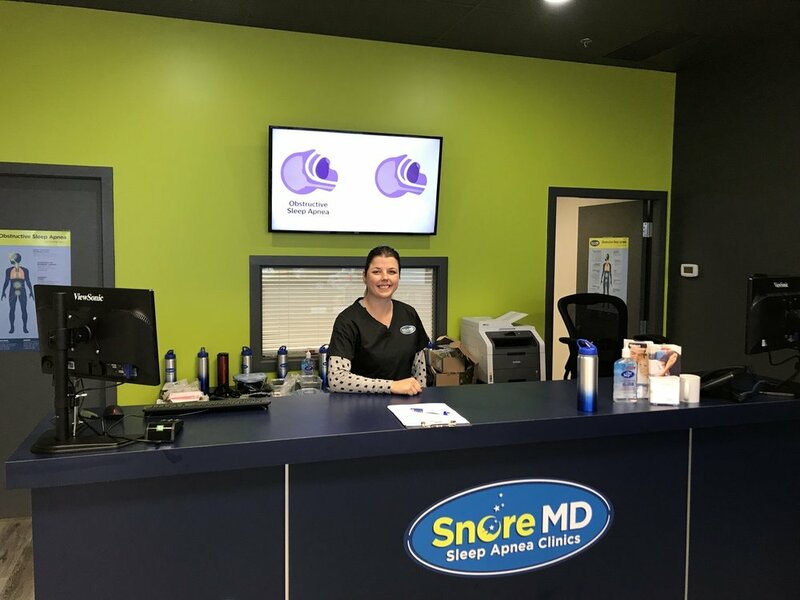 Our Snore MD clinic in Abbotsford is able to provide local residents with a successful sleep solution. We’re unlike any other clinics in the area, and we’re open six, sometimes seven, days a week. These convenient office hours ensure you get the support you need when you need it, even if that means scheduling an evening appointment. Just contact us to find a time that works best for you. We’re also one of the only clinics that doesn’t require a doctor’s referral, and you’ll never have to worry about being placed on a waitlist. In fact, we’re happy to take same-day appointments to better serve the community. We do this to ensure our patients get amazing customer service as quickly as possible. Amanda and Nicki were both amazing at helping me get used to the CPAP machine. I received the kind of support I had never received in the past. To ensure your treatment plan is in line with your needs, our sleep solution team is comprised of key medical professionals. That means, you’ll have Respiratory Therapists and Registered Nurses working together to solve your sleep apnea and snoring concerns. We also have a clinical coordinator that will be happy to answer your questions and get you set up with any equipment you may require. I have always I wanted to help people live healthier and happier lives but hospitals scare me, to death. So I found a career in sleep; so I can make Canadians healthier and happier. I love educating patients and then following them through a therapy that will improve their quality of life. I love to see patients yearly, as I get to see the difference therapy has made in their lives. Just collecting Karma, is all. Be good, do good. My biggest accomplishment? I recently paid off all my student loan debt. My career choice wasn’t in sleep but in the sleep clinic. The very first impression I was given was a warm and welcoming voice at the end of the phone. That set the tone for the entire conversation which thankfully led to an in person interview. Where I was not only impressed with the caliber of what I was hoping to be my coworkers, but by the clinic itself. Tidy, clean, organize and welcoming. It will sound cliche, however my biggest accomplishment in my life is my little boy. He is the light of my life and it is impossible to top that feeling. The close second is from a professional stand point, it doesn’t break down to just one thing though. Its the knowledge I have gained over my many years in customer service and I’m the medical field. I feel very proud of what I have learned and what I will learn in the future to help provide the best support for our patients. The opportunities I have to work with patients suffering is a gift. Being able to offer solutions that will not only improve their quality of life but elongate that life as well is an incredible feeling. All it takes to enjoy a better night’s sleep is a visit to our facility. Come on in to our Abbotsford sleep clinic. There’s a form to fill out, but it will only take a minute. Once that’s ready, you’ll be asked to take an at-home sleep test for two consecutive nights. The results will then be passed along to the professionals for review. At that point, our team will work together and with you to pin point any underlying issues and build a customized sleep treatment plan. Once your plan is set, we’ll continue to check in and support you along your journey to a better night’s sleep. Could you benefit from a restful night’s sleep? Contact our Abbotsford clinic today. When there was a sleep apnea diagnosis in Amanda’s family, she decided to focus her healthcare career in the sleep industry and joined Snore MD Abbotsford in September 2017 as Clinic Coordinator.